Gosh I’ve been meaning to do this post for ages now, have just been very topsy turvy at the moment – can you believe it’s November!? Nest Homegrown is just my kind of company – you know the ones that are so creative you get the warm and fuzzies when you see all the clever products?! 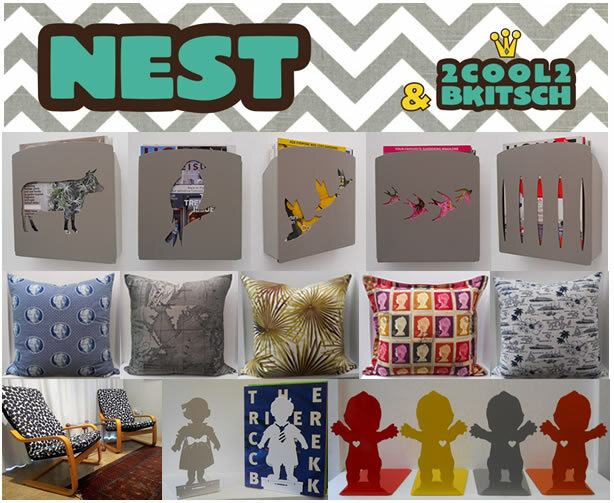 ‘Functional & fun, with a lil bit of quirky thrown into the mix” is the mantra for this Durban-based company who design some very cool bespoke decor items ranging from bookends and cushions, to magazine racks, hooks and hangers. But they’ve also got a 2COOL2BKITSCH range which features some vintage, quirky finds and ‘one-off’ super cool pieces, which they refurbish or restore and sell as one-offs. I adore their magazine racks and the differnet cushion fabrics are fabulous. You can view all their products for sale on the blog or join their facebook group for updates.